Ice Cream Truck Rental & Catering / Contact BLUE MOO - BLUE MOO ICE CREAM TRUCK - Ice Cream Truck Rental/Catering in the Twin Cities of Minneapolis/St. Paul - Contact us today! THE BLUE MOO ice cream TRUCK for your next event. PRIVATE EVENTS: The BLUE MOO Ice Cream Truck can be reserved for all private parties, from small parties to large corporate or social gatherings. We provide a clean, attractive, fun ice cream truck, a delicious menu of top-quality ice cream products. The BLUE MOO Ice Cream Truck will show up at the time and date you request and the BLUE MOO Crew will serve ice cream to your guests. Some dates do fill up quickly - especially for the graduation season. So we highly recommend booking early as possible. PUBLIC EVENTS: The BLUE MOO Ice Cream is also available as a food vendor for your School Carnivals, Community Events, Sporting Events or Festivals. 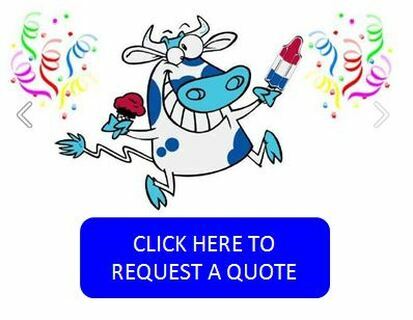 This option is available if you would like a sweet treat available for your attendees to purchase outright from the BLUE MOO Ice Cream truck without any cost to your organization. Contact us below with details about your event, and we will be in contact as soon as possible to work out the details and hold the date for your event.